David Cameron will unveil the Conservative party's 130-page-manifesto, which will pledge to give people greater control of their lives and offer an invitation to join them in government. The manifesto, titled Invitation to Join the Government, will be launched at Battersea Power Station in south London this morning. Among the promises the Conservatives will make is enabling constituents to sack their MP if they have committed serious wrong-doing. People will also be able to call referendums against high council tax increases and on any local issue. The manifesto will also set out plans to create directly-elected police chiefs. The stamp duty threshold will also rise to £250,000 for first time buyers, and it would be made easier for social tenants to buy the homes they live in. The Conservatives will also repeat their pledge to part-reverse Labour's one per cent national insurance (NI) rise, and promise to freeze council tax for two years. There would also be an annual limit set for immigrants from outside the EU. Conservative officials said the manifesto, which has been printed in hardback format, is the result of four-and-half years' work. 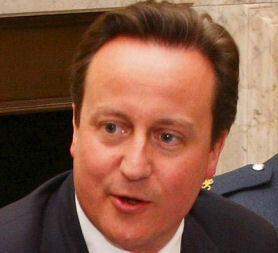 In his foreword, Conservative leader David Cameron said the country needed to "pull together" to solve its problems. "Real change comes not from government alone. Real change comes when the people are inspired and mobilised, when millions of us are fired up to play a part in the nation’s future," he wrote. Labour said the manifesto pledges were a throwback to previous campaigns. Ed Miliband, the climate change secretary, said: "If David Cameron had really changed the Tory party, he would ditch the pledge from ten years ago to cut inheritance tax for the wealthiest few," he said. The Liberal Democrat leader Nick Clegg criticised the Tories earlier in a press conference on bankers and bonuses. He said that it was "unforgivable" for both the Tories and Labour to allow bankers to continue holding the British taxpayer to ransom. He said: "Yesterday Labour said next to nothing on the subject (banking). I predict today the Conservatives will say little more. They'll say 'we're all in this together'. "In fact under the Conservatives you're on your own. They talk about a 'big society'. In fact all they want is a DIY society, where if you are a banker you get off scot-free, and you only get tax breaks if you are a millionaire."